This itinerary is not available for travel from June to September. Travel round trip to Sydney in a rental car. DAY 1 SYDNEY - CANBERRA (300 kms) Pick up your MEDIUM SEDAN rental car at the Sydney City Depot or Sydney Airport Depot and commence your drive to Canberra. Join the Eastern Distributor via South Dowling Street in Central Sydney. This road becomes Southern Cross Drive and continues past the airport to join the M5 travelling west out of Sydney. If you collect your car at the airport, you can join the M5 via Airport Drive. The M5 becomes the South Western Freeway then the Hume Highway. Past Goulbourn, veer left onto the Federal Highway which takes you into Canberra. BERRIMA is just under half way between Sydney and Canberra and is well worth the 5-minute detour off the highway. There are signs for easy location and we suggest you take a lunch or coffee break in this historic township. Berrima is situated in the Southern Highlands and boasts Australias oldest gaol (construction began in 1834), now a minor offenders institution. It housed in its time a number of infamous bushrangers. There are many artists and artisans who live in Berrima, and it is the arts and crafts that they produce which attracts visitors just as much as the history of the town. The Berrima District Museum (in Market Street) is well worth a visit, plus there are antique stores to tempt collectors. CANBERRA is the Capital of Australia and is situated in the Australian Capital Territory, in the southern tablelands of New South Wales. Canberra has five sign-posted Tourist Drives, which take in most of the sights. The best way to gain appreciation of Canberra is to visit any of the lookouts on the surrounding hills. Telstra Tower, on Black Mountain, is 195 metres high and has viewing galleries and a revolving restaurant. On the summit of Mt. Pleasant are memorials to the Australian Artillery and Armoured Corps, while Red Hill overlooks Parliament House, southern Canberra and the Woden Valley. From Mt. Ainslie the visitor can see central Canberra and Lake Burley Griffin. The three most popular tourist attractions in Canberra are Parliament House, the War Memorial and the National Library. Day 2 CANBERRA  SNOWY MOUNTAINS (212 kms) Depart Canberra and travel south on the Monaro Highway to Cooma. Join the Snowy Mountains Highway at the roundabout and continue on to Kosciuszko Road through Berridale to Jindabyne Road. On leaving Jindabyne, take the Alpine Way through to Thredbo Village. COOMA : Originally settled in 1823, Cooma remained the centre of the Monaro grazing area until the Snowy Mountains Hydro-Electric Authority (now Snowy Hydro) was established in 1949. Cooma today is the largest town in the Snowy Mountains and remains the headquarters of Snowy Hydro. The Mosaic Time Walk in Centennial Park depicts life in the Snowy Mountains from its origins through to the present time. The International Avenue of Flags also located in the park contains the flags of the nations represented by the men and women who worked on the Snowy Mountains Scheme. A statue of the famous 'Man from Snowy River' immortalises Banjo Paterson's immortal mountain man. JINDABYNE: The original town of Jindabyne and its inhabitants were relocated in the 1960's when the Snowy River was dammed as part of the Snowy Mountains Scheme, with only a handful of houses being moved to their new location. The remains of the old town lie submerged under Lake Jindabyne and can occasionally be glimpsed when lake levels are low. For great views over the lake at any time head for the Waste Point Lookout on the Kosciuszko Road. In winter Jindabyne is a base for skiers bound for the major resorts in Kosciuszko National Park and for the rest of the year it's a great place from which to go bushwalking, mountain biking, white water rafting and canoeing, horse riding and kayaking. The lake provides superb opportunities for trout fishing and water sports. THREDBO VILLAGE: Thredbo, the closest resort to Mount Kosciuszko, is situated beside the Thredbo River at an altitude of 1370m. The Kosciuszko Express Chairlift operates all year round and the top station boasts Australia's highest restaurant, Eagles Nest. 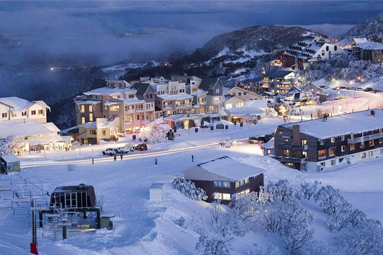 Thredbo is famous for its village atmosphere and great restaurants. Open all year round, Thredbo Village blends a unique mountain environment with cultural events and activities to suit all ages. Village facilities encompass a range of shops, a supermarket and various fashion and gift stores. There are restaurants and bars available to suit all tastes and budgets. The Thredbo Leisure Centre has a 50m pool, sports hall, gym and squash court. Day 3 SNOWY MOUNTAINS - BATEMANS BAY (345 kms) This morning retrace your route to Cooma and join the Snowy Mountains Highway heading east Continue on the Snowy Mountain Highway to the Princes Highway where you turn left. Continue on the Princes Highway through the towns of Central Tilba, Tilba Tilba, Narooma, Mogo and into Batemans Bay. CENTRAL TILBA & TILBA TLIBA: Central Tilba is now heritage listed by the National Trust-and is a working village where you can see a wood turner, cobbler, baker and leather-maker at work. Visit the art and craft shops and taste famous Tilba Club Cheese at the ABC Cheese Factory. Nearby Foxglove Spire Gardens in Tilba Tilba is a romantic woodland garden, featuring roses, wisteria and its namesake foxglove. NAROOMA: Built on land almost completely surrounded by the waters of Wagonga River, its estuary and the sparkling Pacific Ocean, Narooma's name comes from an aboriginal word meaning clear, blue water. These waterways have been the very reason for Narooma's existence, from its early days as a port for the transport of local produce and as a ship building centre and through its many years since, as a popular tourist destination. 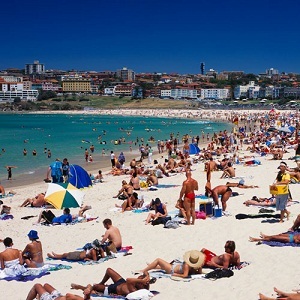 All types of water sports can be enjoyed around Narooma and fishing and swimming are the most popular. MOGO: The uniquely preserved and developed village of Mogo takes the visitor back to the 19th century with its traditional architecture and proliferation of tourist attractions, cottage industries and handcrafts. There are many galleries of fine Australian craft and art work including works from some of the very talented Koori artists on the South Coast. Mogo is also home to the Mogo Zoo where many exotic species are housed, some as part of the world wide preservation program for endangered exotic animals. Here you can see tigers, lions, apes, reptiles and many other interesting creatures from places far and near. BATEMANS BAY: A stunning coastline of beaches, river estuaries and craggy headlands makes Batemans Bay an ideal holiday destination. Cruise the pristine Clyde River, the cleanest of all the major rivers on Australias east coast, or explore the regions many historic villages, where you can relax in cafés, wander through craft galleries and snap up local artworks. Day 4 BATEMANS BAY - SYDNEY (280 kms) Head north on the Princes Highway through Ulludulla, Nowra, Kiama and onto Wollongong to join the Grand Pacific Drive to return to Sydney. The Grand Pacific Drive encompasses some of the most spectacular coastline in New South Wales. Return your vehicle to the Sydney Airport depot or Sydney city depot.